This post was submitted by Patagonia grantee Monty Bassett from the Sage Foundation. January 17th, 2005, in a remote village in the middle of a vast British Columbia wilderness, Roy Quock, an 84-year-old elder of the Tahltan tribe, discovered that his band chief had been touring the world, at the invitation of the World Bank and the Canadian government, promoting the benefits of industrial mining on aboriginal lands. Roy heard on the radio that his chief had been speaking in Guatemala at a mining conference and boasted that he’d negotiated for six mines – four of them open pit, and a giant coalbed methane project – all to begin in his territory within a year. “Enough is enough!” said Roy and he and his younger brother, Bobby (83), trundled down to the band office. Upon discovering that the chief was away (meeting with Shell in Calgary) they said, “We’ll wait.” and they did. With three dozen other elders they waited for eight-and-a-half months until their Chief was turffed, thus starting an environmental fight that would lead to barricades, arrests, and a protest ad appearing in the London Financial Times. Slaying giants, real giants, is something we all consider, but seldom do. Not just giant mountains or huge waves. I’m talking real giants like the second largest petroleum company in the world, Royal Dutch Shell. And not for penny-ante stakes either. What Shell and other giant companies are after are, purported by the British Columbia Ministry of Energy, Mines and Petroleum Resources, billions of tons of coal and trillions of cubic feet of coalbed methane gas, all slated for a wilderness area twice the size of England. Shell’s purported interest in the coalbed methane project could alter three of the west coast’s most important salmon bearing watersheds – the Nass, the Skeena and the Stikine – and severely threaten the health of North America’s Serengeti. Now imagine that these dragon slayers are the least likely activists you could think of: Elder Tahltan Indians, mainly grandmothers and great grandmothers, in a remote region of northwest British Columbia – isolated, voiceless, seemingly powerless. In fact the only things they have going for them are a passion for the land so strong they slept on their band office floor for a 265 day protest occupation, and enough courage to face down bulldozers and be arrested repeatedly over the last three years. Add then the ferocity of a sow grizzly bear protecting her cubs, in this case the elders’ unborn great grandchildren, and grassroots support, including the Patagonia grants program, and there you have it: a force to be reckoned with. Yvon Chouinard has said that to change governments, start with corporations. To save the planet, or at least slow down our rate of destruction, empower grassroots movements. Who better to look after the very thing they know best? The Tahltan elders of Telegraph Creek, B.C. are a case in point. Amazingly, after three years Shell has yet to drill one hole. But Shell has vowed to start drilling this summer. The Tahltan have been joined by the downstream native nations in the affected watersheds, virtually all of the residents of the North, and a who’s who of environmental NGOs. The battle is far from over. 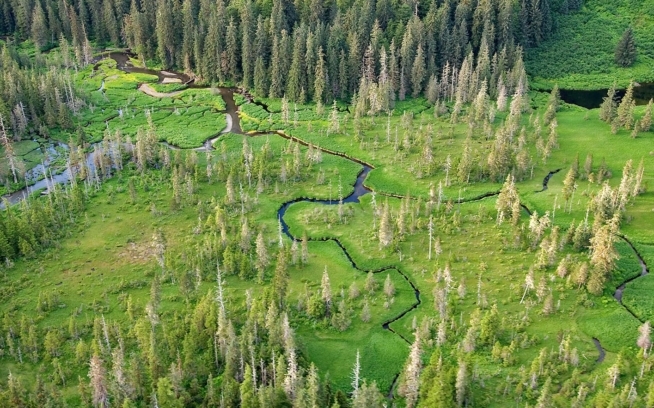 Stay tuned throughout the summer to skeenawatershed.com for updates and opportunities to take action. If you think extracting coalbed methane from this beautiful area is a viable energy option for British Columbia, let us know why you feel that way in the comments. Sacred Headwaters Basin: Origins of three west coast salmon-bearing watersheds. Double rainbow in the Sacred Headwaters Basin.